US rate hike weighs on markets. With a crash of 563 points on Friday, BSE Sensex ended the last week lower by 1,190 points, the biggest weekly loss in four years, driven mainly by global cues. With a crash of 563 points on Friday, BSE Sensex ended the last week lower by 1,190 points, the biggest weekly loss in four years, driven mainly by global cues. Besides the global factors, sustained off-loading by FIIs and lack of fresh buying support even at beaten down prices, drove the markets down in straight fourth week in a row. The poor GDP data and fears of lower agriculture output post-widening monsoon deficit also caused selling pressure. The Sensex for 30-scrip that ended the previous week at 26,392, opened marginally higher at 26,469 and scaled to a high of 26,505 on Monday. However, fresh sell-off in China stocks, and other Asian markets as a consequence, caused fresh selling wave at slightly elevated stock prices in initial trades on Monday and set a stage for a roller coaster ride a day ahead of the domestic GDP data, while data released on Tuesday turned out to be highly dismaying that caused panic selling and sent the markets further down. 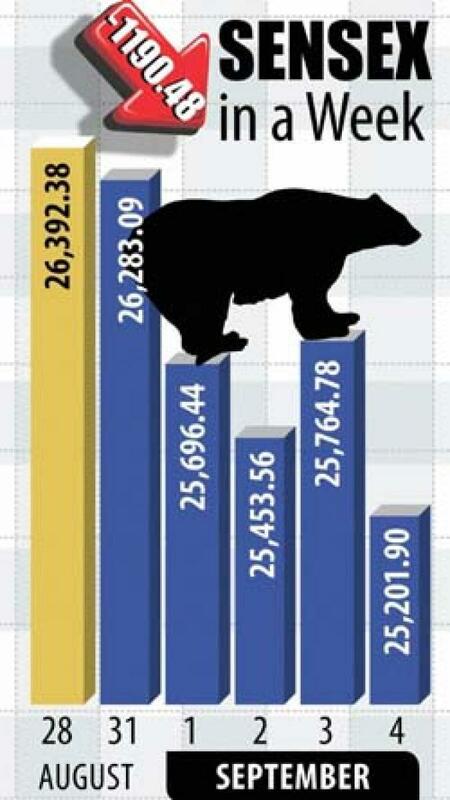 Although, the pace of the prices falling was reduced on Wednesday as bear operators resorted covering their huge short positions and a small rally also occurred on Thursday but the markets again plunged significantly on Friday after US futures opened lower following a fresh dose of devaluation of currency by China. The global sell-off triggered by China when it suddenly came out with huge devaluation of its currency, Yuan, on August 11, thus continued in the fourth week straight as the weakened markets have now become prey to negative domestic and local factors too. The situation in China is not expected to improve soon as the Chinese economy itself is reeling under recession and it would need more and serious action from its banking and stock market regulators besides the Chinese Government, which all could be hurting the global economies and stock markets. At home, the Indian economy is also not in a good shape, though its GDP data has surpassed that of China. The poor monsoon this season has nearly destroyed hopes of an early revival of the economy as most of the government spending would now be diverted to drought relief. On the other hand, the Q1 corporate number season that has just ended, has not been encouraging in any way and Q2 ending September is not expected to be any different. Thus, the markets are not expected to get positive vibes from corporate front, at least, from the ensuing Q2 corporate numbers season. On the political front, yet another major psychological factor is the Bihar assembly polls. It's like a big challenge to the main ruling party, BJP, at centre and the Prime Minister Narendra Modi himself. A likely defeat of BJP and its allies in Bihar would create negative impact on the market, especially after the government's failure in getting the GST and Land Acquisition bills cleared. The prospective investors, are therefore, advised to wait till the decision of the Fed is known. In case, the Fed postpones a decision to hike interest rate this time too, then it could create a positive impact on the markets but only temporarily as the vagaries of a "drought year" coupled with likely rating down-grades would still continue to haunt the markets.Therefore, investors are advised to adhere to the policy of off-loading at rallies and not re-buy even at further declines as the current correction is yet to be over.